Tropical Storm Alberto is moving toward Florida and will make landfall today in the Big Bend region of the state. Heavy rains and tornadoes remain the main threat across the Big Bend and Northeast Florida. Tropical Storm Alberto has weakened slightly as of early Tuesday morning with maximum sustained winds now at 65 mph. Despite some weakening of the thunderstorms near the center of the tropical system, the area of rainfall is affecting much of North Florida and South Georgia. A Hurricane Warning remains in effect from Longboat Key, FL to the Ochlockonee River, FL. AccuWeather.com is forecasting landfall Tuesday morning around 9am edt. Joe Bastardi the lead Chief Forecaster of the AccuWeather.com Hurricane Center is predicting fewer storms, but will still be a season of above-average storm frequency in 2006. In fact he stated that 1 in 6 Americans could be directly impacted by Hurricanes. For the 2006 Hurricane Season-which traditionally runs from June 1 through November 30-Bastardi and his team are forecasting that six tropical cyclones will make landfall in the U.S. Five of these landfalling storms are likely to be hurricanes, with three being major hurricanes of Category 3 or greater. "The 2006 season will be a creeping threat," said Bastardi. "Early in the season-June and July-the Texas Gulf Coast faces the highest likelihood of a hurricane strike, possibly putting Gulf energy production in the line of fire. As early as July, and through much of the rest of the season, the highest level of risk shifts to the Carolinas. From mid-August into early October, the window is open for hurricane strikes to spread northward to the more densely populated Northeast coast. 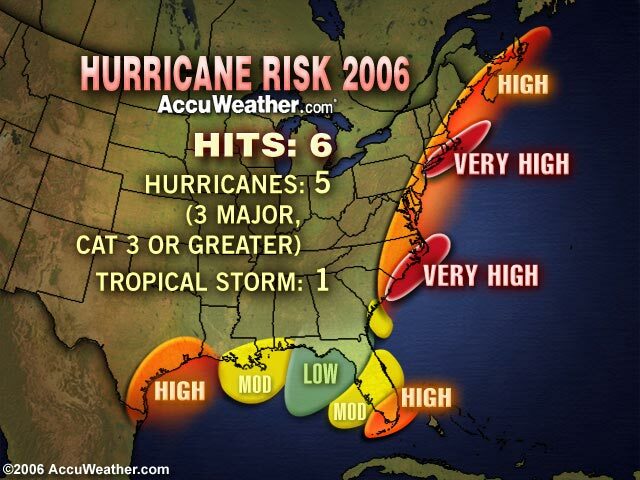 At the very end of the season, southern Florida also faces significant hurricane risk." "There are few areas of the U.S. East Coast and Gulf of Mexico that will not be in the bull's eye at some point this season," said Ken Reeves, AccuWeather's Director of Forecast Operations. Ironically, though, the region that was hammered the hardest last year-the central and eastern Gulf Coast-has one of the lower probabilities of receiving another major hurricane strike in 2006." Added Reeves, "This is not to say that hard-hit New Orleans has nothing to worry about. Because the city's defenses have been so compromised by Hurricane Katrina, even a glancing blow from a hurricane elsewhere could spell trouble for the city." 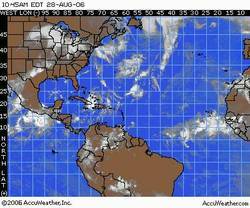 The 2006 Atlantic Hurricane Season begins with rain from the Gulf to the Great Lakes. The season begins with another day of tropical moisture flowing from the Gulf of Mexico into Texas. Chief Hurricane Forecaster Joe Bastardi has been closely monitoring the low pressure in the western Gulf for the past several days. Bastardi says even if the system fails to "feed back and develop" into a tropical system, the heavy rain will continue to hit the coastal areas of Texas into the weekend. Twenty-four hour rainfall totals for the greater Houston area with some areas getting as much as 4 inches. Corpus Christi received just over over two inches of rain from January 1 to Tuesday, May 30. Since then, the city has been soaked with nearly nine inches of rain!